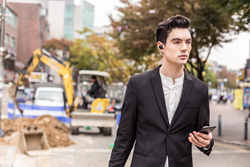 CES Innovation Award winner ORFEO launches automatic noise-blocking mono Bluetooth headset, ORFEO Voice, that can enhance communication in loud industries such as military. ORFEO SoundWorks, a CES 2016 Innovation Award winner in the headphones category, came out with the new technology that can enhance communication in loud industries. These industries such as construction, manufacturing, and military are filled with noise, and it often interferes crucial communication that sometimes involves someone’s life. Yet, ORFEO’s new ‘noise-blocking’ technology removes every industrial noise and only transfers your voice to the other person. While the average Bluetooth headphones or even headsets designated for communication are ineffective in noisy environments because the microphone is located outside, picking up almost every background noise, ORFEO SoundWorks has put the microphone inside the earphone to catch the voice traveling through the Eustachian tube and to block out ambient noise. The earphones then employ patented technology to ensure the voice has a natural sound. This means that clear, hands-free communication is now possible in the construction site, manufacturing facilities, and even in the battlefield – with no shouting necessary.